This is the fifth piece in a six-part blog series on teaching 21st century skills, including problem solving, metacognition, critical thinking, and collaboration, in classrooms. In today’s changing world, students need a broader range of skills beyond traditional academic subject areas that they can apply to a wide range of real-life situations. Students will encounter many future situations where they have to bring together multiple complex skills to complete tasks. Using examples from the U.S. and Australia, we will outline two complementary methods that teach these complex skillsets. In the U.S., a 4th grade reading class uses a method to develop collaboration skills, while simultaneously developing critical thinking skills. Similarly, an example from Australia will show how a secondary level history class also teaches these two skills simultaneously, but with a different method. Being able to discuss our ideas and opinions thoughtfully with others is a crucial life skill. Collaborative discussion relies on peer interaction, communication, sharing, and at times expert guidance to extend student thinking. Students—not teachers—should drive conversations as they present, defend, elaborate upon, and respond to each other. As they make connections, they will clarify their understanding, refine their thinking, and synthesize information. To help illustrate this important skill, Tara Barnett, a 4th grade teacher in Fair Haven, New Jersey, supports and enhances collaborative talk through a number of strategies. When Tara thinks back to her own schooling, she remembers the many times she was asked questions designed to check her knowledge; rarely was she asked to engage in discussion around a text or issue. Now, it is common practice to ask students to turn and talk to each other. However, it is not enough just to provide opportunities; teachers need to teach collaborative discussion skills explicitly and systematically. Tara uses accountable talk stems as a strategy to structure meaningful conversation. This gives students the language they need to engage in discussion with each other. All too often, however, students go through the motions of talking without full engagement. Kids will say, “I agree” or “I disagree” and even give reasons, but conversations often stay at a surface level. They seem to think that using these phrases are the end rather than a means to an end. To address this issue in classrooms, use the following strategies—they are related to literacy lessons but can, of course, be applied more widely. 1) Launch entire-class conversations before moving students to less-supported conversations with partners. Beginning with the entire class helps to establish norms for conversation in the classroom and gives a model for what a conversation can and should look like. 2) Give students a question in which they have to take a stance. In order to have good discussions, ideas need to be worth discussing. If the idea is simply stating the obvious or agreeing with a previously mentioned idea, the conversation will stall. 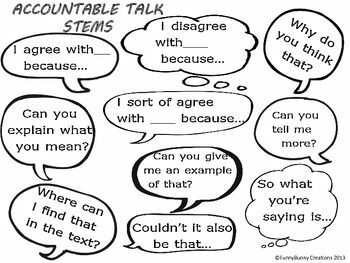 3) If you use accountable talk stems, preface them as a “way to enter the conversation” and list 1-2 stems for each path. The stems support students in thinking about what they are trying to accomplish by making their talk more purposeful and thoughtful. It might look something like what is described in Figure 1. 4) Explicitly teach vocabulary that will support students to enter a discussion. For example, when we want to discuss the characters in Fox by Margaret Wild and Ron Brooks, we introduce words like cunning, optimistic, and pessimistic. After introducing students to these words, they begin to see the connections between the words and the characters, which prompts students to use them in a discussion. Vocabulary support is a game changer for students. Is there one person who is overpowering the discussion or one person who isn’t getting a chance to say much? Students can use their self-assessment to set goals. Reflection and goal setting really helps focus and elevate conversations and makes students accountable to themselves—an essential learning to learn characteristic. On the other side of the world, Ben teaches secondary students at Aitken College, a co-educational independent school in Melbourne, Australia. Although Ben’s class subject is History, when people ask him what he teaches, Ben points out that he teaches “conceptual analysis.” This is his approach to developing critical thinking skills in a collaborative setting as the students learn history. Irrespective of the content or skills learned the ability to analyze material and concepts is crucial. Conceptual analysis can be applied to building structures based on hierarchies or progressions, such as when students are tasked to create their own developmental or progression-based rubrics. It is important to demonstrate to students how rubrics are created and why they are useful because understanding rubrics also helps them structure their task output to match the task requirements. To help them with this skill, have the students to generate a rubric together. Pick a common school assignment, such as a history essay. Ask students to list some of the skills they use when producing a history essay; support the students in doing this by querying statements of what they produce to help them distinguish the actual processes they use. Choose three or four of these processes. Now ask students to describe what different levels of quality of these processes would look like, i.e., a description of an advanced example, and a middle-level example, and a basic level example. Figure 2 shows how this class activity would look like when completed as a grid, where for each step in “researching,” the students provided what they think are different levels of quality. Students are demonstrating sub-skills that are important components of conceptual analysis: differentiating, organizing, and attributing. They are differentiating by recognizing that the words generated in a brainstorm can be classified. They are organizing by placing them in different categories. We could extend the task by asking students to come up with sub-categories and sub-sub-categories. This helps students deconstruct a concept. Students who can understand how to break a task down like this are much more likely to develop and demonstrate the skills and sub-skills involved. With this task, we could also show students a few examples of other student work and ask them to grade them according to the rubric they created. Critical thinking is a systematic way of looking at the world for the purposes of reasoning and making decisions effectively. Although we may define critical thinking in a more complex manner, it is essentially a practical or applied activity because reasoning and decisionmaking are applied activities. Conceptual analysis is a useful tool to help students do critical thinking activities collaboratively, and it can be taught in a team-based or collaborative setting. Both conceptual analysis and collaborative discussion strategies show that they can be applied practically in diverse classroom tasks for teaching multiple complex skills such as working collaboratively and thinking critically—two of the 21st century skills that will become increasingly important as the new generation of students move into the workforce of the future.